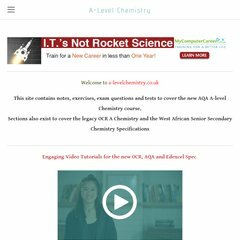 a-levelchemistry.co.uk OCR (Oxford, Cambridge and RSA Examinations) is a unitary awarding ..
On average 5.00 pages are viewed each, by the estimated 94 daily visitors. It has 3 DNS records, dns1.phonecoop.com, dns2.phonecoop.com, and dns3.phonecoop.com. The programming language environment is ASP.NET.